Prize giveaways are designed to reward our customers and persons within our state with prizes we purchase or obtain through our partners. Your entry into these contests includes you allowing us to promote your name, image, video and other materials provided by you or images and videos taken of you by our dealership staff and partners. By entering our contests, you hereby freely and without restraint consent to and give unto Toyota of Santa Fe and its agents or assigns or anyone authorized by Toyota of Santa Fe, where permitted by law, to print, publish, broadcast, distribute, and use in any media now known or hereafter developed, in perpetuity and throughout the World, without limitation, your entry, name, portrait, picture, voice, likeness, image, statements about the Campaign, and biographical information for news, publicity, information, trade, advertising, public relations, and promotional purposes. without any further compensation, notice, review, or consent. By entering our contests, you also agree to allow us to add your name to our database of customers and products. This list is used to provide promotional offers or product information that may be of interest to you. Whereas, TOYOTA OF SANTA FE (the “Producer”) is engaged in a project (the “photo” and “video”), and Whereas, I, the undersigned, have agreed to appear in the photo & video, and Whereas, I understand that my voice, name, and image will be recorded by various mechanical and electrical means of all descriptions (such recordings, any piece thereof, the contents therein and all reproductions thereof, along with the utilization of my name, shall be collectively referred to herein as the “Released Subject Matter”), Therefore, I hereby freely and without restraint consent to and give unto the Producer and its agents or assigns or anyone authorized by the Producer, (collectively referred to herein as the “Releasees”) the unrestrained right in perpetuity to own, utilize, or alter the Released Subject Matter, in any manner the Releasees may see fit and for any purpose whatsoever, all of the foregoing to be without limitation of any kind. Without limiting the generality of the foregoing, I hereby authorize the Releasees and grant unto them the unrestrained rights to utilize the Released Subject Matter in connection with the Photo’s advertising, publicity, public displays, and exhibitions. I hereby stipulate that the Released Subject Matter is the property of the Producer to do with as it will. I hereby waive to the fullest extent that I may lawfully do so, any causes of action in law or equity I may have or may hereafter acquire against the Releasees or any of them for libel, slander, invasion of privacy, copyright or trademark violation, right of publicity, or false light arising out of or in connection with the utilization by the Releasees or another of the Released Subject Matter. It is my intention that the above mentioned consideration represents the sole compensation that I am entitled to receive in connection with any and all usages of the Released Subject Matter. I expressly stipulate that the Releasees may utilize the Released Subject Matter or not as they choose in their sole discretion without affecting the validity of this Release. This Release shall be governed by New Mexico law. Entering any contest by Toyota of Santa includes your agreement to the foregoing. Our contests are limited to persons 18 or older. 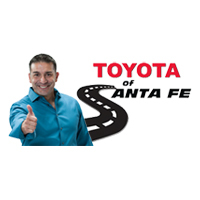 1601 St Michaels Drive, Santa Fe, NM 87505 or 1920 Cerrillos Road, Santa Fe, NM 87505 or during any Toyota of Santa Fe Sponsored Event.